On a drivetrain with a steel chain and steel cogs, why wouldn’t you want to use a steel chainring? 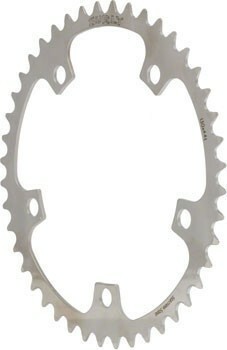 Most chainrings on the market are made from aluminum, which is 35% softer than stainless steel. A softer metal means a shorter lifespan. Enter the Surly Stainless Steel chainring, made from 304 grade stainless. You can now have an all-steel drivetrain that will love you long time. Stainless, as it’s name implies, is a rust and corrosion-resistant alloy steel that is known for it’s toughness. Like all things mechanical, it will eventually wear out. When it does, simply flip the chainring around and you’ll get another lifespan out of it. Our chainring is ideal for single-speed, fixed gear or tandem timing chain applications. It is not ramped or pinned for shifting assistance, so shifting will be a bit slower if using these with a front derailleur.